Dr. Brian McManus grew up outside of Charlotte, NC. After graduating from North Carolina State University with dual bachelor of science degrees in Biochemistry and Microbiology, he received his Doctor of Dental Surgery degree from the University of North Carolina at Chapel Hill School of Dentistry. His extensive training included educational rotations in surgical hospital dentistry at Wake Med Hospital in Raleigh and community dentistry at the Durham County Health Department. Dr. McManus is passionate about the innovative use of tooth colored ceramics and composite resin in dentistry, keeping up to date on the latest innovations in the use of ceramics and bonding techniques. 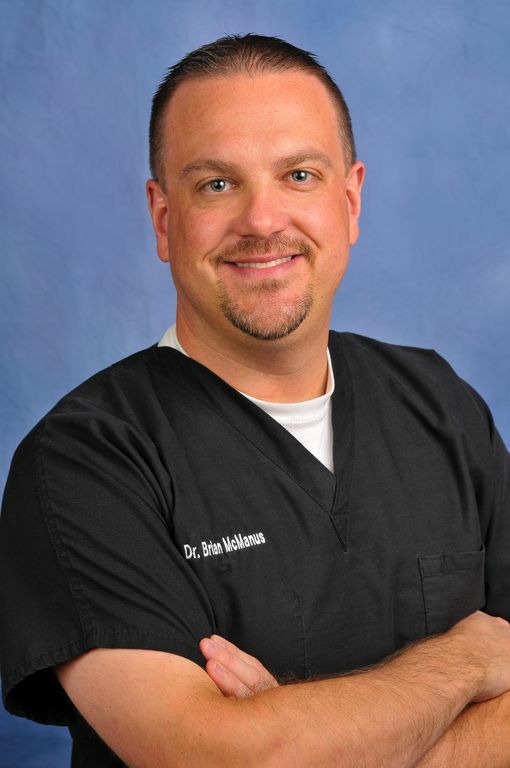 As one of North Carolina's most experienced providers of short-term cosmetic orthodontics, he is a Preferred Provider with Six Month Smiles. His top goal is to help patients achieve a beautiful smile using the best materials on the market today. He focuses on prevention, teaching patients to improve their overall oral health care by stopping problems before they arise. Drawing on experience as a former published clinical researcher prior to entering dentistry, Dr. McManus stays on top of the most current scientific data and literature in the field by constantly examining published scientific data. He enjoys treating patients of all ages, and has completed training in the Baby Oral Health Program (BOHP) at the UNC School of Dentistry to provide preventative care to infants 6 months and up, as well as special needs patients. Dr. McManus enjoys watching NC State Wolfpack and the Carolina Panthers, and spending time with his wife, Keri, and his two sons, Aiden and Grant. He is a member of the American Dental Association, the North Carolina Dental Society, and the Academy of General Dentist.